Tired of hoses that state they are kink free, but eventually kink on you? The Tuff Guard Hose is truly an unkinkable hose. 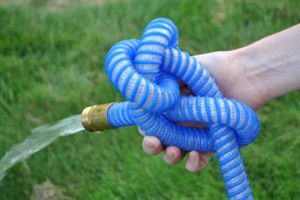 In fact you can even tie the hose in a knot and the water will still run straight through the hose without a problem! The Tuff Guard Hose is made from a unique polypropylene double helix construction that enables the hose to be 35% – 50% lighter than other garden hoses as well as stay flexible and weather resistant from -20°F to 158°F. The Tuff Guard Hose is also abrasion, chemical resistant, and crush proof! The hose couplings are made from a heavy duty brass ferrules that is thread onto the outer helix to anchor the couplings to the hose making end pull-offs and leaks virtually impossible. So if you sick of replacing hoses, or tired of lugging around your heavy duty garden hose consider purchasing a Tuff Guard Hose. You won’t be disappointed!